Did I mention that seconds after Mom showed me her dead cell phone, I found her boarding pass on the floor of the restaurant? This is when I confiscated all of her travel documents, and would not let her have them in her possession… until we ended up in a fight while being forced to go through customs in Canada. Yes, dear reader. Thank you for paying attention. I will tell you all about Canada, but not until later, because right now in this story Mom and I are still trying to get out of Newark. 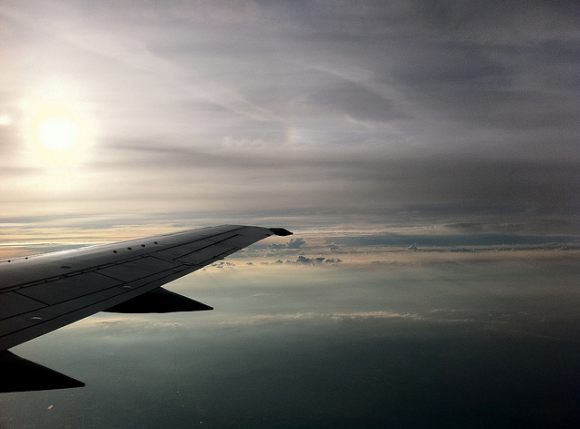 I fly rather often, so I’ve gotten into my flying groove, and I forget that it’s different when you travel with someone who doesn’t fly all that often. Where I’ve got a system (some might call it THE SYSTEM) that probably makes me rather annoying to partner with if you aren’t a normal part of THE SYSTEM, someone who flies every once in a great while has no system. And for someone with a system that can be… well, completely frustrating. I remember Tara tweet-complaining once that she can’t understand nor forgive nor be at peace with the fact that some people get on a plane and then just sit there, staring straight ahead. For hours. Who does that?! What is that?! Are you that opposed to reading? Are you meditating? What does that kind of person do for fun — sit in gridlocked traffic? It’s shifty, is what it is. Get a magazine. There’s one right in front of you in the little pocket. Jesus. Just be normal while we’re all on the plane, can you? I fly with about sixteen different forms of recreation (THE SYSTEM works), which means that if you’re flying with me and you run out of paperbacks, I have backup media I would be more than willing to offer to share. (Including to you, Seat Starer). Our flight was a redeye to Frankfurt, so what I’d also packed with me was some glorious Benadryl. THE SYSTEM says that I must take the Benadryl as soon as the flight is safely in the air and beverage service is beginning. There are several (very good) reasons for this, the first being that you never know if the flight will be delayed or cancelled, and Benadryl works rather quickly on me. I don’t want to be slobbery and passed out in 12D when they are asking everybody to get off the plane and be smart enough to figure out how to get on another one or stand in a very long line on the other end of the terminal while they pretend they have a plan for getting you to your final destination. We were in bulkhead seats, which are not the best seats when it comes to THE SYSTEM. I’m short, so legroom isn’t my first priority, and bulkhead seats always have tray tables that are worse than high chair trays. I hate having to navigate around my own breasts to see my laptop, or have my elbows poking my neighbors’ ears if I’d like to try to eat using utensils. So. Middle seat. All of my belongings up above me and out of my reach. I’ve got a Kindle and a paperback (because you can’t read a Kindle during take-offs and landings), and Mom’s next to me with her paperback… when the flight gets delayed due to storms over the Atlantic. We are told we will sit on the plane until we wait out the storm. What we couldn’t have known right then is how long we’d be waiting. We sat there for two and a half hours. She is sixty years old. That’s the reason we’re even on this flight, because the woman is sixty years old. I would think by now she would know that when she’s wearing headphones and has the pre-flight entertainment volume cranked to full blast, she doesn’t need to yell over that noise to talk to me. That guy is Brendan Fraser. And she does love him. We finally do take off and I do take my pill and I think maybe things will be okay, and the lights start getting turned off and it quiets down on the bumpy plane. This is when Mom tried to watch IRON MAN 2. I’d wake up, try to help her fast forward, suggest she read a book, anything to feel like I got her settled, because I didn’t want to fall asleep while Mom was wide awake. I was deep into THE SYSTEM by this point, and deep, drug-fueled redeye flight sleep was imminent. And then I dozed off. When I woke up a few minutes or maybe an hour later, I took my sleep mask off to check on Mom. There she was, sitting there, staring straight ahead. And I realized: she had no choice. I gave her a Benadryl. And forced her to be a part of my system.